As one of a the large-scale enterprise, Zhengzhou CamelWay Machinery will give you a brief introduction on the powder equipment of hzs60 concrete batching station. 1, whole sealing device for the powder conveying, discharging mouth and weighing hopper adopt soft connection does not affect the measuring accuracy. 2, material mouth for universal ball joint, adjustable Angle deviation, and good sealing. 3, spiral vane and simplified small gap, high transmission efficiency. Top of the power house has spill-proof top device, cement resulting into round the cement silo load pressure reduction, and prevent the pollution of dust in the air.Vicious arch device placed in the cones, combined with pneumatic system and control system can be automatically broken arch, real-time of cement can be manually broken arch. 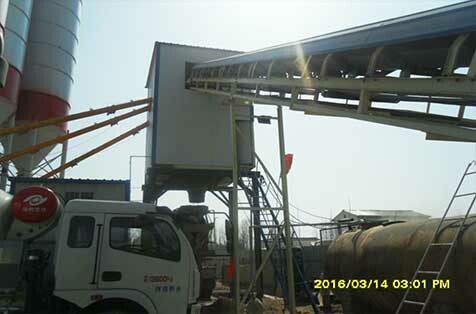 If you are interested in concrete batching plant or mixing equipment, please feel free to contact us at any time. You also can leave your message in the below, we will give you a reply in 24 hours.